I am trying to implement a computer player for my tic tac toe game. I am using a list to move the computer player, I want to index in the list and then remove the value I have selected. I want to select a unique value from the list each time. And finally, here we're trying to remove from an indexed location, but passing a value from that index instead of the index itself. Just make sure you're matching apples to apples. Methods that want an index should be passed an index. Methods that want a value should be passed a value. //    so it can persist between turns. Prep its capacity to 9 entries. // 2. Have a dedicated method to put stuff in order when starting a new game. // Erase any remaining moves left-over from last game. // Prep the moves list with one of each move. // 3. Have a function to choose a random move when you need one. //    This just picks from the existing list, it doesn't make a new one. this code works correctly I am posting so that I can help others. is there anyway I can make the X input more bulletproof. How to make a world-to-player inventory system? Player positions in a race game through arrays or…? 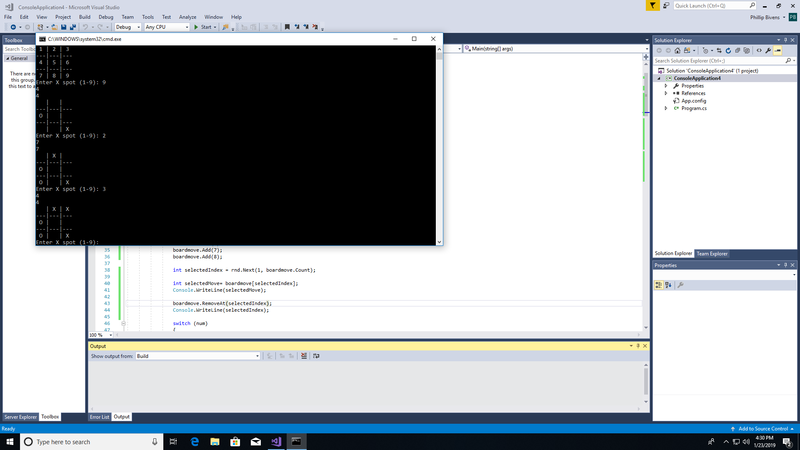 C# How to add inventory to player, NPCs, and in-game objects? How can i move the player randomly between the waypoints? How do I simplify this code with an Array and counting int up in Unity? Why when getting random index from a List the index is higher then the List count?